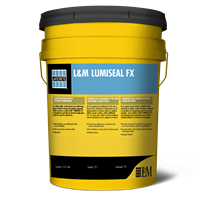 L&M/Laticrete | Salmon Bay Sand & Gravel Co.
L&M Brand of LATICRETE® supplies all you need to keep concrete surfaces and floors clean, sealed and protected from damaging chemicals, water and oils. Repellent products protect concrete from the damaging effects of water, road salts, chemicals and oils and are VOC compliant! Repellent products are perfect for commercial and industrial building floors as well as outside applications like driveways and concrete parking lots. Salmon Bay stocks the L&M brand of Laticrete products. L&M™ CURE™ is a VOC-compliant, ready-to-use, nonresidual concrete curing agent that penetrates surfaces to cure the concrete from within. L&M™ DRESS & SEAL™ is a sprayable, medium gloss acrylic copolymer that cures, seals and dustproofs concrete. L&M™ DRESS & SEAL WB™ formulations are water-based, low VOC, acrylic copolymer solutions that cure, seal and dustproof concrete without yellowing. · L&M™ PETROTEX™ is a ready to use, quick drying, multifunctional, water-based concrete protectant which develops oil and water repellency, resisting staining for improved aesthetics. Provides improved water repellency to reduce cracking, spalling and freeze/thaw damage.